Just call us or click on the Request A Pick Up link to schedule your first pick up. Thereafter, simply leave your dry cleaning at the designated home location on your pick up day. You do not need to call or wait for the truck—our driver will collect your Bright Blue Bag and deliver your fresh, clean clothes on the next scheduled delivery day. With 1-800-DryClean there are no delivery fees or minimum requirements. 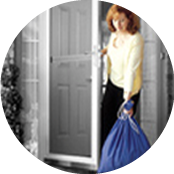 1-800-DryClean drivers will pick up and deliver to an easily accessible location, even your back porch or by using your garage key code. Are you ready to take "go to cleaners” off your errand list? Just enter your zip code in our local dry cleaning service finder above and request a pick up. We’ll take care of the rest. You don't need to be home. Just put your garments in the Bright Blue Bag on your designated pick up day.